We created the brand for Hardwicke Enterprise a while ago (take a look at the case study), and since then they’ve been keen to build on this with regular communication to their customers. They asked if we could design a newsletter template in line with the new brand – and since then we’ve put together a Christmas campaign and a newsletter to shout about their new video (take a look – you can see the team in action and it’s got a catchy tune…). We know that consumers sometimes feel bombarded with advertising – but at the same time they want to know about the company they’re buying from; what their values are, who works for the company, how they’re growing and so on. So it’s important to create something with a strong message that is clear and concise but catches their attention. 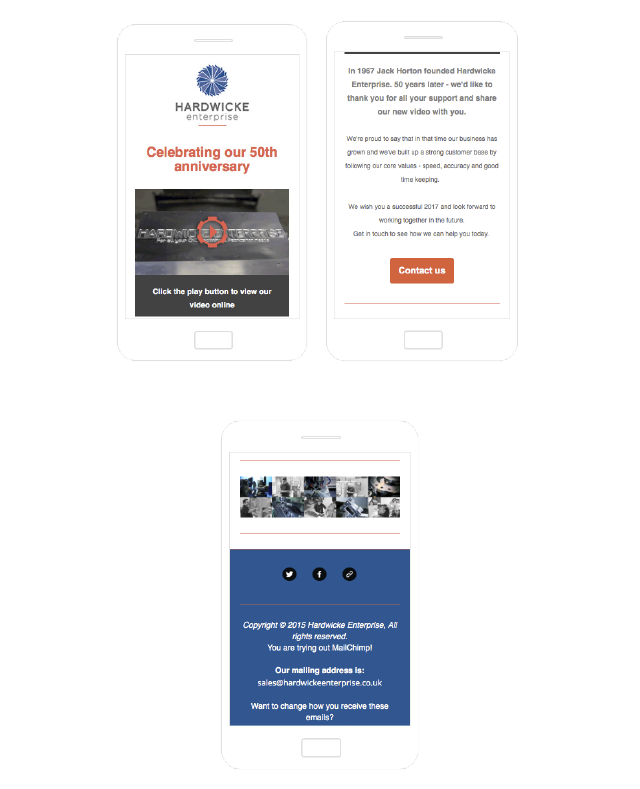 Some animated headers were designed to bring the emails to life – and with nearly 70% of customers opting to view their emails on mobile – the emails were ensured to have impact primarily on that platform.